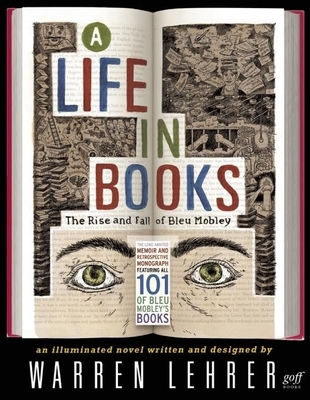 A LIFE IN BOOKS: The Rise and Fall of Bleu Mobley is an illuminated novel containing 101 books within it, all written by Lehrer's protagonist who finds himself in prison looking back on his life and career. Nearly a year after the controversial author is thrown into a federal prison for refusing to reveal the name of a confidential source, he decides to break his silence. But it's not as simple as giving up a name to the grand jury. Over the course of one long night, in the darkness of his prison cell, he whispers his life story into a microcassette recorder, tracing his journey from the public housing project of his youth, to a career as a journalist, then experimental novelist, college professor, accidental bestselling author, pop-culture pundit, and unindicted prisoner. Warren Lehrer is a writer, designer, and multimedia artist known as a pioneer in the fields of visual literature and design authorship. His books, acclaimed for capturing the shape of thought and reuniting the traditions of storytelling with the printed page, include: "Crossing the BLVD: strangers, neighbors, aliens in a New America"; "The Portrait Series: a quartet of men" (four book suite); "GRRRHHHHH: a study of social patterns"; "French Fries; i mean you know; and versations." He has received many awards for his books and multimedia projects including: the Brendan Gill Prize, the Innovative Use of Archives Award, three AIGA Book Awards, two Type Director's Club Awards, the International Book Design Award, a Media That Matters Award, a NY Book Show Best of the Best Award, and a Prix Arts Electronica Award. He's received fellowships and grants from the National Endowment for the Arts, New York State Council and Foundation for the Arts, the Rockefeller Foundation, the Ford Foundation, and others. His work has been exhibited widely and is in many collections including MoMA, LA County Art Museum, The Getty Museum, Georges Pompidou Centre, and Tate Gallery. Lehrer is also a performer, and has co-written four plays, one opera, co-composed two audio CDs, and he co-produces public radio documentaries and audio works with his wife Judith Sloan. Lehrer is a professor at the School of Art+Design at Purchase College, SUNY, and a founding faculty member of the Designer As Author grad program at the School of Visual Arts. Together with Sloan, Lehrer founded EarSay, a non-profit arts organization dedicated to uncovering and portraying the lives of the uncelebrated in print, on stage, on radio, in exhibitions, electronic media, and through educational programs in public schools, community centers, and prisons. "In Warren Lehrer’s ingenious, one-of-kind novel, A Life In Books: The Rise and Fall of Bleu Mobley, we see all the covers of all 101 books supposedly written by the narrator over the last several decades... A tour-de-force!" "For anyone who has ever resisted judging a book by its cover, now's your chance: In A Life In Books, author and graphic design visionary Warren Lehrer crafts a vivid kaleidoscopic odyssey that frames one man's life through not one, but one hundred different booksand book jackets. In this quirky, yet unmistakably modern evocation of the illuminated manuscript, Lehrer's book reminds us that we are what we do. And, for that matter, what we publish." "A tour de force of graphic design, illustration and writing. Exploiting a wide range of illustration styles to delight the eye, Lehrer offers a funny, thought-provoking and refreshing twist on the graphic novel Guaranteed to bring a smile." "Warren Lehrer's novel A Life In Books is a masterpiece of visual storytelling, boldly integrating illustration and typography into its engaging story." "A Life in Books: The Rise & Fall of Blue Mobley, a gorgeously produced multi-color novel,” is a brilliant meditation on the state of publishing in the 21st Century. What is truth? What is fiction? Who is me,” am I my nom de plume, and how can I turn us into a franchise or maybe even into two?! By the time you reach page 330 with pictures of Bleu’s Book Lamps, you’ll be laughing through your tears... I can’t think of a better gift." "A Life In Books is unique, incredible, affecting, meticulous, the perfect hide-and-seek game, and honestly, one of those works that seems so obvious and fertile as a structure, it’s hard to believe it hasn’t been done before. Am I gushing? I just love it. This is an important book."